1. Com B V Raghavulu campaigned for CPI(M)'s candidate for Kurupam assembly seat, Kola Avinash Kumar. Both TDP and YSRCP have put up members of erstwhile Kurupam royal family as candidates, claiming themselves to be STs. Com. Raghavulu called on the voters to defeat them and vote for Avinash Kumar who truly represents the tribal people and has worked on the issues of scheduled tribes. 2. Com Mallu Lakshmi contesting from Nalagonda parliamentary constituency in Telangana. Her campaign has been met by huge crowds. She promised to take CPI(M)'s fight for safe drinking water and irrigation water to the Parliament. In Devarakonda region of Nalgonda, the water is highly unsafe for drinking due to high floride content. Each successive government including the TRS completely ignored this problem, while CPI(M) has been fighting for the solution to this problem. Under KCR government Nalgonda farmers are facing a crisis in irrigating their crops. Previously they were getting water for 2 crops from Nagarjun Sagar. But now the government is not ensuring adequate water for one crop. As a result, there is serious drought condition prevailing in Nalgonda Com. Lakshmi said that she will continue CPI(M)'s fight for water for Nalgonda in as well as outside the parliament. 3. Com. Raghavulu was campaigning in Araku, Andhra Pradesh for Killo Surendra who is our candidate for Araku assembly constituency. Talking about tribals' rights to lands under Podu cultivation, Com. Raghavulu reminded people that CPI(M) has been consistently fighting on this issue, while both YSR and Chandra Babu have consistently denied tribals the rights over their Podu lands. Out of the 35 lakh acres Podu land cultivated by tribal farmers, tribals have not received legal rights for even 3 Lakh acres of land. He asked the voters to question both TDP and YSRCP - Why they did not support Left Parties' demand in parliament that farmers should receive Rs. 150 as MSP for every 100 Rs they spent on cultivation. He appealed to the people of Araku to vote for the Left candidate. 4. 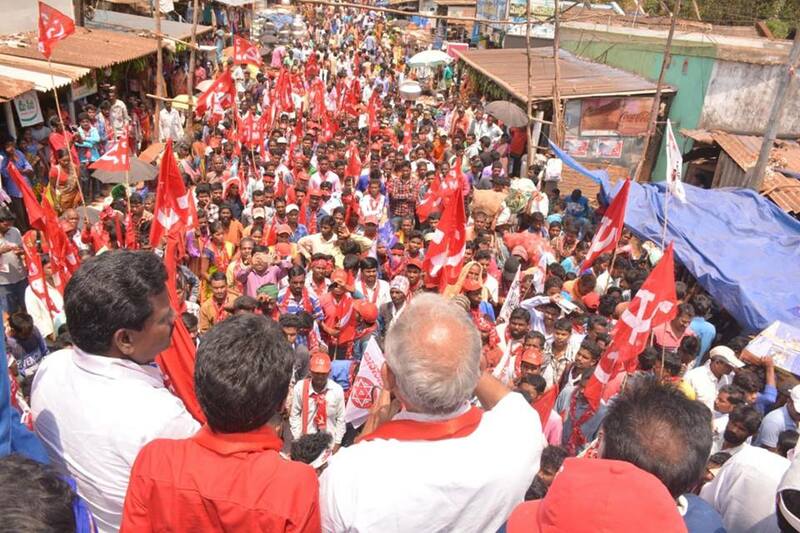 Comrade Prakash Karat campaigned in Aakiveedu town, East Godavari district. He appealed to the people support CPI(M)'s candidate for Undi assembly seat as well as the Left and Jana Sena alliance's candidate for Narsapuram Loksabha seat K. Nagedra Babu. Speaking of the BJP government he asked - Where are the 10 crore jobs that Modi promised? The country, has never faced the levels of unemployment in the last 45 years, as it is facing today. Modi and BJP have deceived farmers, workers, youth - all Indians, with false promises. Farmer's were promised an MSP which is 50% over and above their cultivation cost - but, it did not happen. Modi promised all Indians that he will bring back money from abroad and deposit Rs. 15 lakh in everyone's account - this proved false. Instead, demonetisation dealt a death blow to small businesses, traders, workers and farmers. He pointed out that there is not a whit difference in the policies of Chandra Babu and Jagan. Jagan stands for the same policies as the congress party, out of which he formed the YSRCP. While TDP government has grabbled hundreds of thousands of acres of land belonging to farmers in the state. He said that CPI(M) has come in front of the people with the agenda of implementation of 150% of cultivations costs as MSP for Indian farmers as well as a minimum wage of Rs.18,000 for all workers - be it permanent or temporary.